This item has been downloaded 5801 times. 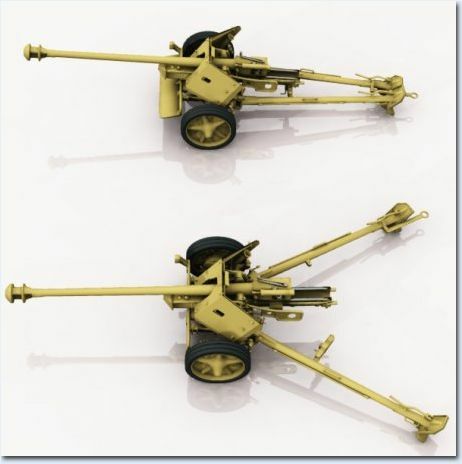 Late model PAK 40 7.5cm Axis artillery Gun. The 7.5 cm PaK 40 (7.5 cm Panzerabwehrkanone 40) was a German 7.5 cm anti-tank gun developed in 1939-1941 by Rheinmetall and used during the Second World War. By 1943,the PaK 40 formed the bulk of the German anti-tank artillery and was the standard German anti-tank gun until the end of the war, being effective against all allied tanks eith the exception of the IS-2 & M26 Pershing,and was supplied by Germany to its allies. - Rotating each wheel independantly or together. Note: The lower armour shield is also moveable if required but I could not find any reference as to how it was secured. I therefore decided to leave it to the users discretion.